iRk- DGaF inhouse tournament - FINALS! It is time for the conclusion of a two month inhouse tournament to decide who is going to be the champion of iRk! ..and now it's time for the finals! On friday 15th loser bracket finalist iRk-Dewalt is going up against winner bracket finalist iRk-Naugrim in the GRAND FINALS (bo7). Naugrim is starting with 1-0 and picks the first map. The games will be casted from replays at 20:00CET by none other then BSL caster LMaster and iRk's own iRk-Tim on https://www.twitch.tv/agge_irktv. Make sure to tune in on some friday night fun when these two titans go up against each other on a map pool between 2000-2014. 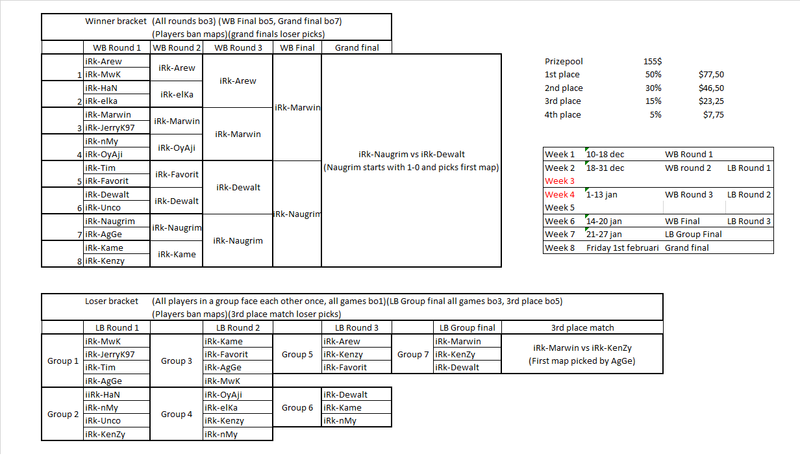 GRAND FINALS: iRk-Naugrim vs iRk-Dewalt 20:00CET Friday evening! iRk-Kenzy vs iRk-Marwin 3rd place match! Next up: iRk-Naugrim vs iRk-Dewalt tonight 20:00CET @ https://www.twitch.tv/agge_irktv make sure to tune in! The final between iRk-Naugrim and iRk-Dewalt!